Thomas Pearson, a minister's son, was commissioned in the 23rd Foot, Royal Welch Fusiliers, in late 1796. In a fascinating military career that spanned nearly 47 years he fought on three continents, was wounded five times, received two battlefield promotions and achieved the rank of general. Fix Bayonets! follows this hard-biting soldier and the Royal Welch Fusiliers in action in the deserts of Egypt, the dikes of the Netherlands, the jungles of the West Indiea, the mountains of Spain and the vast forests of North America. Through Pearson's true-life adventures we learn about war, wine, women and song in a colourful epoch, and also meet a cast of famous and infamous characters, including King George III, Napoleon, Wellington, President James Madison, General Winfield Scott, Marshals Soult and Massena and Lord Nelson. The centrepiece of Fix Bayonets! is a blow-by-blow account of the bloody 1811 battle of Albuera. Albuera was the high point of Pearson's military career -- he went into it as a junior major in his brigade and came out as the brigade commander because he was the only officer above the rank of captain still on his feet. Fix Bayonets! also contains detailed accounts of the War of 1812 battles of Crysler's Farm, Chippawa, Lundy's Lane and Fort Erie. Thomas Pearson fought in all four engagements and was wounded in two of them. Although he put many of them in their graves, Pearson came to have a high regard for his Yankee foemen, describing them as "the bravest men I have ever seen" -- high praise from a combat veteran who had fought against some of the toughest soldiers of his time. Fix Bayonets! is an excellent book, which is indeed a different approach to a well-known subject area. Because it covers a wide canvas and includes so many useful facts about the era in general and the British army in particular, I would humbly suggest that this would be a welcome addition to any Napoleonic enthusiast's collection, and I unreservedly recommend it. " 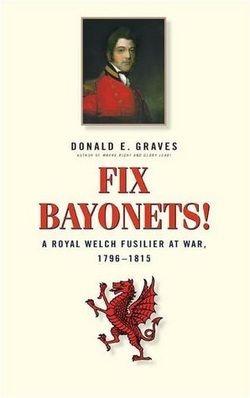 "Donald E. Graves is probably Canada's foremost military historian; his accounts of battles of the War of 1812 are models of historical reportage, and here he turns to biography with the same consumate skill. ...... The result is a brilliant evocation of the period. ...... attention to detail is one feature that sets Graves's work apart, but others include the elegant style and lack of sensationalism, whether describing an action or the human cost in its aftermath. ...... This is military history at its very best, an account that draws the reader in completely, yet is based on thorough and dispassionate research." "Fix Bayonets! ... is highly recommended for serious students of military history and for casual readers looking for stories of true adventure in the War of 1812 and Napoleonic Wars. It's a damned good read." "This is a true adventure story of an officer (Sir Thomas Pearson) who ends up in the thick of fighting (wounded 5 times) all over the planet in the Napoleonic wars. ...... The author Donald E. Graves is a master of battlefield story telling and he simply allows the facts and events to tell themselves without colouring them with any Nationalistic bias or spin. How refreshing. [A] lot is made of the fictitious character, Richard Sharpe of Sharpe's Rifles. If you enjoy Sharpe, well how about a book about a person who actually did deeds that are not the fabrication of someone's imagination?" "I can honestly say that, of the many books that I have reviewed over the years, one stands out as a masterly piece of work. It is not surprising -- the author, Donald E. Graves, is a renowned Canadian military historian with a score of books to his credit. While basically a military biography of Lieutenant-General Sir Thomas Pearson, Fix Bayonets! is much more. ...... [The author's] account of the battle of Albuhera is a masterpiece. ...... Not only is the battle described in meticulous detail, but a welath of information on campaign living conditions and personalities of the opposing armies indicates a great deal of extensive research. ...... There are hundreds of anecdotes, a profusion of illustrations depicting not only military leaders, but drills and living conditions of the era and orders of battle for major engagements. The book is well written -- despite its wealth of information it makes for easy reading. I would particularly recommend it to readers whose interest in the Peninsular War has been generated or revived by the Sharpe TV and book series. ...... Definitely an A-plus! "